And it is a SUPER happy Friday for me because I am retreating with some of my best gal pals. Lots of scrapbooking, food, laughter, and assorted other great things! So today's post is a short one - gotta get back to all the fun. My image is from Lori Boyd - you just can NOT beat her images. They are so fantastic. I gave her a quick purple coloring job and then decided she should have black hair as a contrast to all the bright purple. I love the way it shines! 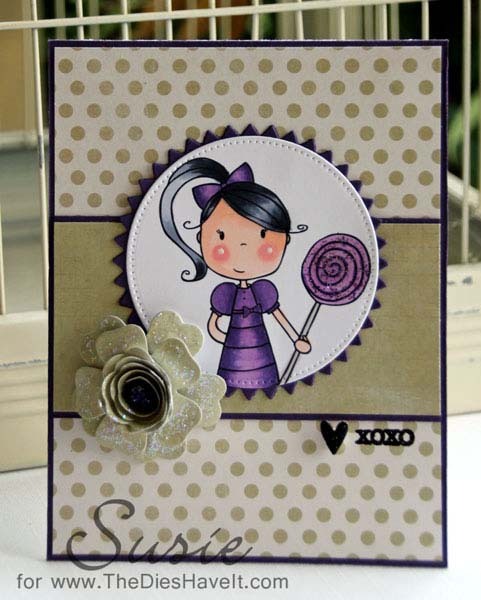 My 3-D flower is made from the Mini Hybrid Heirloom Rose die set from MFT Stamps. It is a three piece set that I HAD to have! So that's it for today. Come on back tomorrow and I'll see you then.